Joe Stark has been a soldier. Served in Iraq and Afghanistan. He's been shot and badly damaged in a bomb explosion. He's been in rehabilitation for physical and mental scars. He still requires treatment with weekly visits to the hospital. He's now moved to Greenwich in London to join the police as a trainee detective constable. His immediate superior is a female detective sergeant - Fran Millhaven. She resents her DCI Groombridge and Superintendent Cox treating Stark with what she considers undue compassion and respect. Stark is assigned a case of GBH on homeless people. A local teenage gang from one of the rough estates are thought responsible. Stark has to quickly learn to fit in whilst still having nightmares from his wars. Despite his disabilities can Stark settle into the police service? His love life gets complicated when he falls for one of his therapists, but can she look past his badly scarred body and find the real Joe? However Stark has a secret that he is keeping from his employers. He has received a letter from the MoD and one of the Army captains is anxious to speak with him, but he's just as anxious to avoid her. 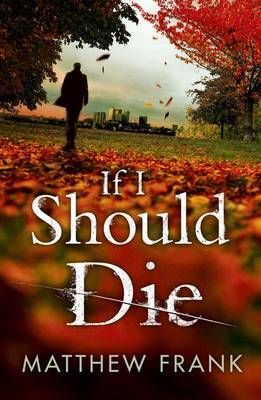 IF I SHOULD DIE is an interesting police procedural, with undertones of the Army at war, and how on their release from active duty many are ignored by the Army and the Government. Perhaps the author has been a soldier or one of his close relatives has served? This is a different book from most police procedurals, but a good debut and well recommended.